Hello, hello, hello. I have so many fun pictures and stories to post here, especially from a lovely wedding I went to in Greece last week, but this business news post was meant to go up while I was away… and it didn’t. So please indulge this news about pretty dresses, I’m sure it isn’t too much of a hardship though! 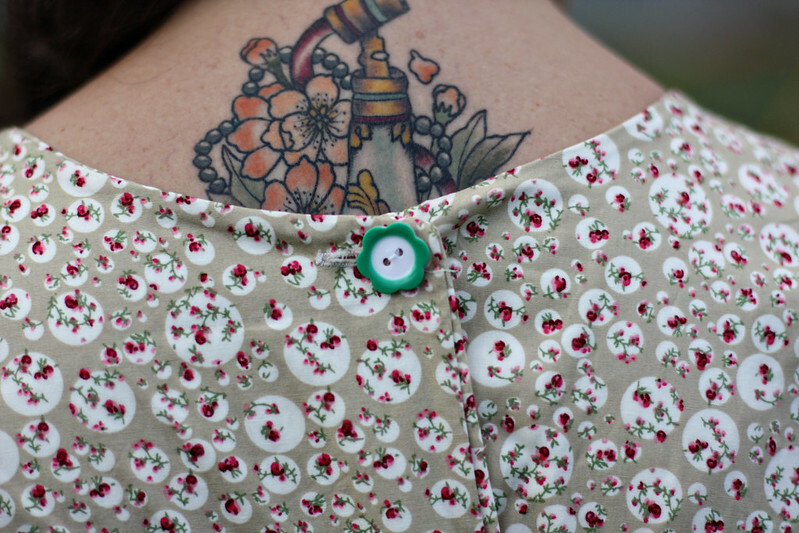 So you may remember a short while ago I posted about the PinaFleur, a new dress collab with Heyday. The first run came up slightly short which was great news for petite ladies, not so much for tall-ies. But the next one was not too short. It is perfect for a range of heights! Still adoring my lilac combs from Belle Blossoms! 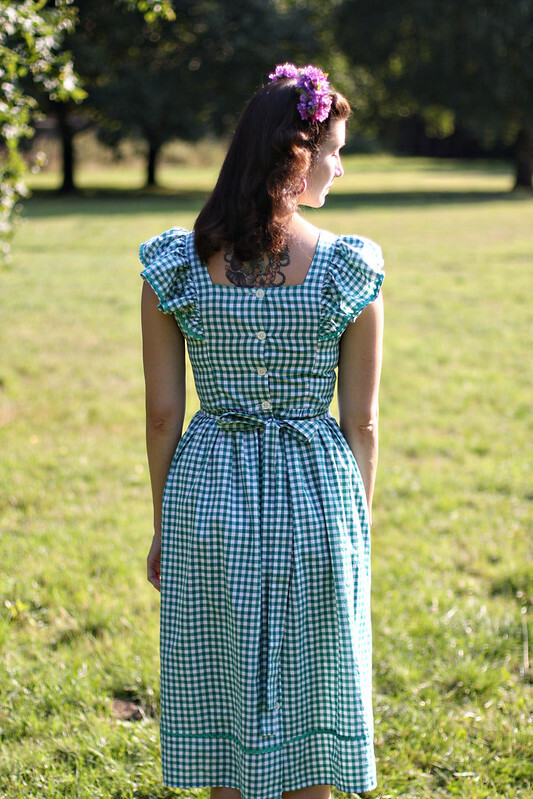 Now you may live in the Northern Hemisphere and be feeling it is a little chilly for summery gingham, and you’d be right (although all you Southerners please feel free to go wild on summery fabrics), so we have also launched an autumnal-hued Fleur wrap dress in a quality cotton. Pop a slip underneath and it’s an outfit that’s going to last you until it starts turning *really* cold. The Garden Circles Fleur dress has a light biscuit brown/beige background with white circles filled with pink and rosebuds. The navy version of this was our best-seller! The neckline and pockets have been bound n forest green to bring out the green leaves of the flowers and make it more autumnal still. And here’s me with some dinosaurs just for good measure. Shoes here also by Swedish Hasbeens. I am addicted. Hope you like the frocks and the fabrics we chose. Back to bore you with my holiday snaps soon! i really appreciate the work of heyday! . the longer pinafleur is gorgeous! I love both of those dresses, especially the first one! A few years ago, my great-grandmother sent my mom home with a bunch of old photos. There's one of my great-grandparents in the early '40s and my great-grandma is wearing a dress almost exactly like the PinaFleur. Both your dresses are just lovely! Such wonderfully pretty dresses! The sleeveless (ruffled sleeve) version would be perfect over long sleeved button front tops/blouses and thin knits for the chillier months of the year. 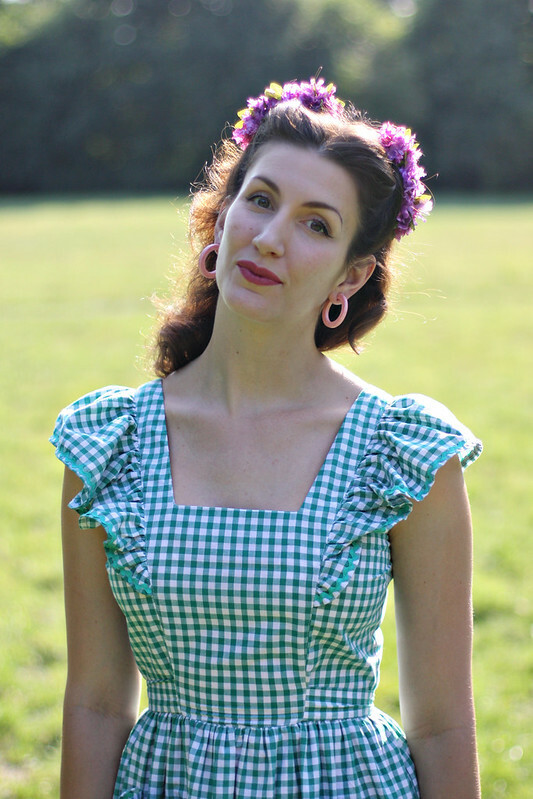 I often wear my sleeveless vintage and repro dresses this way (otherwise they might not see much play for the half a year at least when Canada is shivering cold). Love your casual style and colors. I like your post, your dress is quite simple as well as graceful, generally my wife love to wear such kind of dresses and you are looking very beautiful in this dress.